What was the best thing that happened to childhood? Of course, one would say, love and pampering of doting parents. Remember those colourful, talking pictures? Comics, yes, comics, the picture stories, which brought visuals to words. The ones which always refreshed us in free periods and tiffin times in school and leisurely hours at home. Comics were short-cuts to entertaining reads, less cumbersome than big, fat novels, as one could quickly flip through the pages, enjoy the visual impact while digesting the story at the same time. Talking of comics, I am reminded of many ....Phantom, Asterix, TinTin, Archies, Mandrake and above all Amar Chitra Katha which brought history and mythology to bedrooms in easily understandable language and enchanting images and they stayed on in our memories even as we crossed over many thresholds in life. My father disapproved of comics. He said they were bad reads lacking literary value. "You will spoil your sense of language if you stick to these trashy comics." Yes, he was right. In comics, pictures take over lengthy descriptions as in novels. Comics are not for those who love the 'feel' of language. But comics made a reader out of a non-reader. Some of my friends, despite having a dislike for reading, would relish comics. Comics made reading easy and memorable too because anything visual is retained in memory longer than mere words. However, in today's gizmo-age, books and comics have been replaced by computer/mobile games and play stations. We seldom find children reading. Even modern parents do not insist their off springs to develop the habit of reading because it is expensive and quite a waste of time, especially, when everything is available on the internet! In contrast, we, who are brought up in joint families, have grown on a steady diet of historical, folk and mythological tales narrated by our elders, mostly as bedtime-stories. The visuals in comics provided a kind of post-narrative-easy-connect to the stories already heard several times before. And that was the fun part of it. For me King Nala was the one whom I had seen on the pages of Amar Chitra Katha. So was Raja Harish Chandra, the handsome, bold and virtuous king, depicted on the pages of the comic book, which first introduced him to me. Before that I had only heard but not seen him. In fact, Amar Chitra Katha, or for that matter any comic book, surrogated the television set we never had at home. Today children do not find interest in comics because they are exposed to much grander, larger-than-life depictions of historical and mythological characters on TV and YouTube, which we in our childhood days, could not even think of. As science and technology take over the mantle of startling us and making us gaze in wonder and awe at the TV and Computer screens, by creating fantasies and animations in 3D , the printed pages which originally mothered these fantastical tales, languish in neglect and shame in some remote, dusty corner of rusty cupboards and locked stores. And so are we bereft of simple pleasures of our childhood - the tactile association with pages, print and pictures! But not anymore, thought I. Surfing through Flipkart, I suddenly decided to recreate the happiness of the past. I ordered for an Amar Chitra Katha comic. 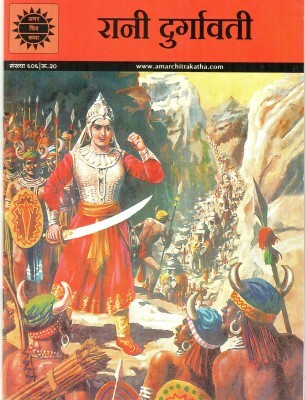 This time it was the story of Rani Durgavati. To be honest, I had never heard of her name. History is a subject which is dreaded by most (me included) - it is difficult, boring and hard to retain in memory. But the comic series of Amar Chitra Katha, translated in so many Indian and foreign languages and English, have made history fun and easy, mythology closely relatable and folk an indivisible part of our cultural grooming. The Story : Durgavati, the princess of Mahoba (presently in Madhya Pradesh), has been brought up more like a prince. She is an ace horse-rider, a skilled shooter and often accompanies her father, the Rajput king, in hunting games. Durgavati, attracted by stories of valour and power, marries Dalpat, the Gond prince. It is a union of love but a social mismatch as Gonds are a caste lower than Rajputs. In due course, Rani Durgavati gives birth to a cute baby boy. They name him Beer Narayan. But soon after, King Dalpat dies of an incurable disease and Rani Durgavati has to take up the responsibility of governing the kingdom on one hand and rearing a fatherless child on the other. She turns out to be a benevolent ruler taking care of her subjects like a mother, a fearless warrior as she wins battles after battles consolidating her kingdom and the quintessential Indian woman who would rather take her own life than fall prey to the lusts of invaders. Thus, goes the story of Rani Durgavati, who in modern parlance, truly stands tall as an "empowered" woman with a political vision. The Creator : Anant Pai (September 1929 - February 2011), popularly known as Uncle Pai, was an Indian educationist and a pioneer in Indian Comics. He was the creator of two famous Comic series - (1) Amar Chitra Katha which recounted traditional Indian folklores, mythological tales and biographies of historical figures; and (2) Tinkle, a children's anthology. Amar Chitra Katha comics are now available in economy packs (ten-in-one, five-in-one, six-in-one) too. They are available online as well as in book stores. You can visit their website (http://www.amarchitrakatha.com/ack/) to know more. I am glad to note that the quality and content of the series have been well retained. These are timeless as they connect us to our roots, make us aware of our history and heritage and help instill values which are an intrinsic part of our Indianness. Even after so many years, being well into adulthood, reading the story of indomitable courage and will of Rani Durgavati, I did not feel bored or uninterested. Rather I was back in my childhood and enjoyed it more than I ever did. And that is what must have been Uncle Pai's intent - to make us alive, happy and knowledgeable at the same time. And the only way that we can pay tribute to this great visionary is to encourage the new generation to read his creations and recognize the worth of his contribution to children's literature. Nice post! and good to read about the warrior queen! Thanks Ankita. Did I forget to mention Chacha Chaudhary ? I should pick up one now. One of the inspiring stories I had read. Reading comics have been my favourite pastime during my childhood. However it's to be admitted that considering the children's passion for comics in that era, several comics with poor quality of stories were also circulated in the market which was quite lucrative then. I have read the story of Raani Duragawati and thanks for refreshening my memories. Amar Chitra Katha has done a yeoman's service to the world of comics and more than that to the world of knowledge of the historical figures not only for the young ones but also the adult ones. I salute to the creator. And kudos to you too for coming out with this nostalgic post. I agree. There were a few bad one too. But overall the comics that I have mentioned in my post and a few in vernacular did more than make up for the real trashy ones in circulation. Thanks for being on this post. So relate to your father's comment about comics, my parents thought exactly the same and comics were banned! :) But I read some all the same, but mostly I was reading fat books so they didn't say anything. I still love reading books/comics of childhood - great fix of nostalgia. Thanks for refreshing the memories. Even I read big fat books .They are irreplaceable. Yes, me too! I missed on Chacha Chaoudhury. Shall read him now. Always a pleasure to revisit! Nothing like comics to lift up ones spirits!